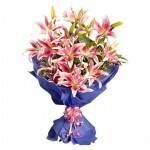 Stargazer lilies are the most elegant oriental lilies for any celebration or occasion. This bouquet of 10 amazing pink oriental lilies packed with lots of seasonal fillers in a simply wrapped in a contrasting elegant paper and a matching ribbon bow. The bloom of every lily has a magnificent touch which is scattered through out the hot pink petal and the tips of the blooms are outlined in white.